Like Google Pages, Picasa Web Albums too will expose your GMail address to email spammers if you use the default web settings. We have some tips for you here that can help alleviate the email spam problem. How spammers will discover my email address from Picasa web ? The default address of any photo album on Picasa web is http://picasaweb.google.com/GMail-UserName. That means your precious email address is embedded right inside a public URL . When search engines index the Picasa Web pages (and they will as there is no option that says don't index), all an email spammer will do is run a simple query like site:picasaweb.google.com. Immediately, he gets a list of all GMail Usernames, will append them with @gmail.com and his email database becomes ready for spamming. How can I prevent spammers from stealing my Gmail address via Picasa Web ? 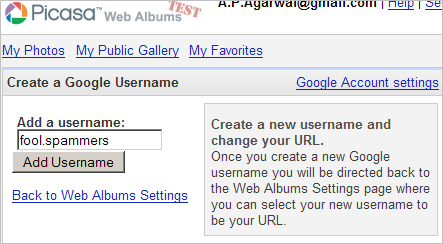 Open the Picasa Web Settings page and click the link "Want to add a new Google username?" Just enter a new username here. That's it - your actual GMail username is now hidden from spammers. Make sure you inform friends and family of the new Picasa Web location as the previous one will return a 404. Here's a more detailed guide on how to hide your email address from email harvesting robots.